Apple launched the eMac (education Mac) back in 2002 for the education market. It was significantly cheaper and more durable than the iMac of the time which had just been redesigned with a radical new lampshade form, comprising of a flat lcd screen pivoted on a dome base. In contrast to the new iMac the eMac had a similar design to the original imac, a much bulkier form based around a 17 inch crt screen. Obviously the crt was the main area where Apple was able to produce the eMac much cheaper than the iMac. But although the eMac looked very different to the iMac on the outside, on the inside the eMac had the same G4 processor and graphics as the iMac. Unsurprisingly many consumers caught on to the idea of having a G4 based Mac at a price that simply hadn’t been possible before, and thankfully Apple decided to bow to consumer interest and made the eMac available to everyone. The eMac was only around for 3 years and the design remained the same in that time, the only exception being the 2 speakers, which in later models came fitted with grills. Presumably the grills were added to protect the speakers in educational settings. Aesthetically the eMac looked better without the grills and it’s also thought that the grills may have lessened the sound quality. I recall people removing the grills on the later models using bent paper clips, though it had to be done with extreme care, as to much force could easily snap the thin plastic. 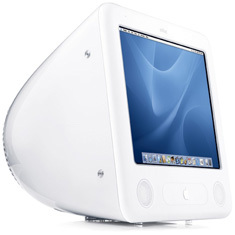 The eMac 1.25 GHz was the first modern Mac that I owned, like many other people it was the price that had the biggest impact on my decision. Ironically it was bought from PC world as it was the only place around where you could buy Macs from. The 1.25 GHz was available with either a standard DVD-ROM/CD-RW combo drive or a (DVD-R/CD-RW) SuperDrive, as I didn’t need to burn DVDs I went for the combo model. Back then the price of that eMac was £550, and when you consider that the cheapest Mac you can buy at the time of writing this post costs £400 without a keyboard, mouse or screen the eMac has to be one of the best value for money Macs that Apple has ever produced. Although I found the eMac to be a very stable and reliable Mac it did have a few minor flaws. The speakers are very poor, music sounds distorted and because they are located just under the screen, the speakers can cause a slight flickering effect on the display. Once you plug in external speakers those flaws disappear though. Another thing to be aware of is that the eMac has quite a noisy fan, I never really noticed it when I was using it as my main machine - it’s only after using newer Macs that it seems quite loud. I suspect that if I had to go back to using it for longer amount of time I’d get to used to the noise.